Imagine Cup 2013 final submission for Games Competition is near! Do you think that you do not have enough time to participate? No need to worry. Creating game apps in Windows 8 are quietly simple and fast! Find it it out by join the Casual Game Development workshop at Universitas Indonesia. It’s free! Windows 8, student can use Windows 8 evaluation for developer with 90-day evaluation. Click here to download. Visual Studio 2012 express for Windows 8. Click here to download. Windows 8 SDK. Click here to download. Construct 2. Click here to download. Still want more after this program? Be ready and prepare your apps for Imagine Cup 2013 in Russia! 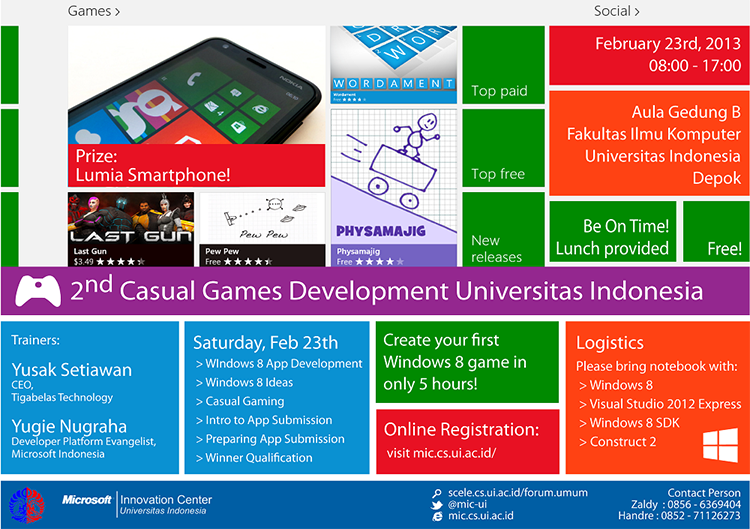 Click here to join Windows 8: Casual Game Development Workshop! nice campaign! saying baru liat sekarang..
unfortunately UI did not make to final this year. Sorry kelamaan bales komennya karena jarang ngeblog jg.